Yet another track that I haven’t been to and need to learn, one that is apparently similar to the previous track in Malaysia due to its unpredictable weather, the same designer in Hermann Tilke and tight but fast corners. I go into this round ill with a cold or perhaps even the flu, which will no doubt make the race harder to endure, particularly after the other sessions leading into it. After a fairly decent result in Malaysia I approach this track with some confidence but also some apprehension -- the fact I have to learn it means that anything could happen and, if rain does indeed play a part, the conditions could either suit my driving style or hinder it, so time shall tell as the weekend progresses. I do have to say, though, the track is quite amazing architecturally, the structures sitting above the track on the front straight (easily visible from the paddock and pit garages) screaming futuristic, sleek and perhaps even alien design; it’s really quite remarkable and definitely a sight to behold. Well, China is a lot trickier to learn than I was personally expecting, its insane amount of bumps and tight hairpins really grabbing your attention if you’re not careful. The track in itself is indeed quite like Malaysia, even opening relatively similar with its right-hand, long and sweeping hairpin first corner before switching abruptly and immediately into a left-hand one. While China’s first turn is longer (which means a faster speed can be maintained in the initial moments of it, before a hard braking section to ensure you hit the late apex) than Malaysia’s, its second one is shorter, the chance to begin accelerating coming earlier than that circuit but trickier due to the four or so bumps that sit perfectly right where you want to accelerate. China also has a small straight after this corner whilst Malaysia veers to the right for another sweeping turn quite quickly, before both circuits mimic each other again with a tight fourth turn -- Malaysia’s characterized by the uphill, blind but not so tight apex, whilst China’s by its severely tight hairpin where it is very easy to run off. I mention the comparison not to offer an opinion on either circuit but to highlight how confusing their similarities can be: because the China round follows right on after Malaysia’s, it’s very easy to get caught out in your rhythms as your mental map tricks you into thinking you are running a lap of Malaysia rather than China. I found it an interesting -- if minor -- challenge to deal with and definitely a feature that defines the Shanghai circuit. Anyway, as you’d expect my first run saw quite a few times where I went wide at a few corners -- the tight hairpin after the back straight proving to be particularly tricky -- as I came to terms with the circuit. Its tricky corners caught me out more than a few times, the bumps in particular being my main concern (and surprise). The desire to accelerate out of the various corners early is very tempting but the bumps prevent it through their uncanny ability to induce wheelspin regularly -- something I had to be mindful of as I continued to learn the circuit. 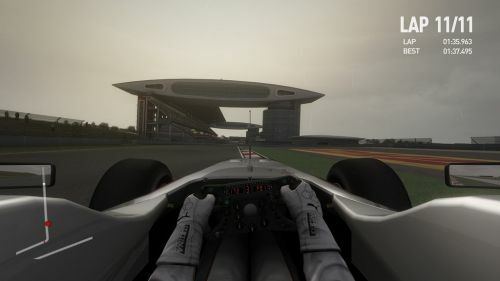 I was pleased, however, to see my track-learning skills remain, the Shanghai circuit quickly entering into my mental picture despite the similarities to Malaysia. It was confusing at times, but I got a handle on it a lot quicker than I expected to so that was nice. My second run was better though I did get caught out a few times in turn 3 where a bit of wheelspin saw me careening off the track as I tried to catch it. Nothing serious, though. In my third run the team wanted to try some research and development parts, expecting me to achieve a lap of 2:05.933 once the parts were fitted -- something I managed easily on my first timed lap. My success means that I will get reduced rear tire drag at 5.0%, though I have no idea what that actually means -- I just drive. It was around this time that I also noticed it was significantly overcast, however the rain never eventuated. My fourth run was average with a lot of moments including a few run offs, a few missed apexes and having to catch wheelspin on the bumps. I did learn, however, that short shifting (changing gears at lower revs) was my friend, as it helps maintain grip and lessens the chance of wheelspin out of those trickier corners. My fifth run was short and messy so I came in early to switch to the Option tires. In turn 3 I went into the gravel trap after missing the apex, and in the long sweeping turn that brings you onto the back straight I had a half spin, which incidentally ruined a good lap. My sixth run, on the Options, was better, the new tires surprising me once again with their insane levels of grip and faster times. I improved my lap time by 2 seconds with still more to find, but caught a bump in turn 3(seems to be my sticking point) just as I was accelerating out and over those tricky bumps. This caused another half spin, though again it was minor. I also went wide on that sweeping long corner (my other sticking point, apparently), catching the exit curb wrongly and had yet another spin, this time on my in lap back to the pits. It was sunny again by this point though quite hazy due to the severe amount of smog that was permeating the track’s complex. My seventh run was great with no mistakes and another second shaved off my lap time. My engineer made an intriguing statement too, suggesting that it becomes really obvious when I find confidence in a circuit and start to push its limits and those of my skills, referencing the data that they have in the garage and how it changed from cautious approaches to corners and later pushes on the throttle, to deep entries and earlier exits -- a really insightful thing to hear as it correlates with how I felt as I became more comfortable with the track. My eighth and final run was okay, my Option tires going off so I couldn’t match my time I had set earlier but it was still good practice, something I definitely needed with the still relatively unfamiliar circuit. Overall for the session I did a total of 22 laps, my fastest time so far being a 1:38.008 which netted me 7th place. Mark Webber was first, his teammate Vettel second (separated by 1 thousandth of a second no less -- absolutely crazy!) and Hamilton third. Definitely a great session in which I learned quite a lot and quickly too -- important, I think, in terms of the weekend’s potential. Sunny conditions yet again, with a 47% chance of rain. We’ll see what eventuates, however. My team wanted to try some more R&D tests, this time expecting a 2:05.759 which I thought was very easy given my knowledge of the track. My first run was over remarkably quickly, the bumps in turn 3 catching me out yet again and throwing me into the wall on my exit lap (no less), my front wing dislodging in the process. After sitting in the pits for repairs (and feeling slightly embarrassed), I went back out for my second run which was better, the team’s R&D goals met with ease. It was a good, clean run, and due to coming out behind Webber I was able to follow him for a few laps. It was fascinating seeing the different approaches he took to each corner and how well his Red Bull car performed generally -- it’s definitely in a different league to my Virgin. My third run was short as I decided I wanted the Options instead, due to the foreboding, overcast weather. I wanted to set a good time before the rain settled in, a decision that proved to be fruitful as my fourth run, now on the Options, was when the heavens decided to open their doors and start casting drizzle all over the circuit. Because of this I actually thought I had made the wrong call as I came out behind Buemi whom I had to pass heading into turn 1 just before a yellow flag thanks to two cars who had spun in turn 3, but my subsequent laps were good despite the rain, proving that I seem to perform quite well in unpredictable, uncertain conditions. The rain increasing rapidly, I switched to the Intermediate tires for my fifth run, it quickly proving to be a wise choice due to a puddle in turn 6 which I aquaplaned on, my front right tire dipping into the inside of the apex and thus inspiring the officials to give me a warning for corner cutting. Despite feeling like I had eliminated my corner cutting problems from earlier in the season, it was a warning I could accept quite easily as it didn’t feel intentional and certainly not my fault. The rest of the run was smooth, some good practice under my belt. The sixth run for Practice 2 was marred by the exit curb of turn 6, my weak exit catching it incorrectly and inducing an unnecessary spin. Strangely this resulted in yet another warning for corner cutting as I was trying to recover, simply because I was on the inside of the corner. I’ve accepted all of the warnings I have received so far, putting them down to rookie mistakes or errors but now I’m starting to wonder if the officials are being a little unfair. By this point the rain was steady and seemed like it was here to stay, a point I welcomed as I wanted more practice under wet conditions. It was funny, though, the track didn’t seem to be as slippery as I thought it was in the initial laps of P1 even as the track became increasingly saturated. My seventh run was clean and consistent, though the car did try to step out a few times thanks to the wet surface. The rain seemed to have eased a little as hints of a dry line were starting to appear, but it also seemed to be quite steady going down the long back straight. My eighth run was nothing, the rain no longer falling meaning the Intermediate tires were useless and it was better to switch to the Primes. I got a warning for gently colliding with Robert Kubica exiting the pits which I thought wasn’t right as it wasn’t my fault he didn’t give me any room by going a little bit wider. My ninth run, now on Prime tires was characterized by my amazement at how quickly the circuit had dried, the grip returning extremely quickly and as if there was no water at all. Chandok was coming up behind me as I exited the pits so I stayed wide in turn 1 to let him past but he spun instead. Not sure why. I also managed to only be a few tenths behind the time I had set earlier on Options, which was both good and bad -- good because it demonstrated that I was comfortable with the track but bad because it highlighted how insignificant my lap on the Options really was. I decided to go out for a tenth and final run just to confirm my progress over the session but only got one flying lap in due to the session expiring. A total of 19 laps with a time of 1:39.284 done on the Options before the rain settled in, which secured 12th position for the session. I think it was the rain that hindered my ability to match the times set in P1 though being a practice session it doesn’t really matter so long as I made progress which I feel I certainly did. The warnings were annoying though, mostly because they didn’t feel justified. I’m confident for tomorrow. Dry and sunny conditions, though a touch hazy once again due to the smog that surrounds the circuit. My team wanted some more testing with another easy target time of 2:05.759 which I achieved on my first flying lap in my first run, no problems. Those times were very lenient which was nice as it meant I could focus on other things. I turned in a bit too early on my second lap at the hairpin at the end of the back straight and bounced over the inside curb more than normal, spinning as I accelerated off it. A similar thing happened on the third lap at the turn 8/9 kink, the lap also featuring some debris a little earlier in turn 4. For some reason I wasn’t enjoying this session due to feeling uncomfortable in the car. My gloves weren’t on properly so it didn’t feel right as I gripped the steering wheel, and I also seemed to be sitting a little differently too. My second run was also uncomfortable, an off at turns 7/8/9 adding to the discomfort as the bumps in the gravel bounced me around a bit. The reason for the off was accelerating too early, and it didn’t affect my session other than some lost time as I recovered. On my fourth lap I went wide in the final turn but it didn’t matter as the lap was ruined earlier due to Schumacher exiting the pits in front of me and getting in the way a bit. My third run was clean though I wrecked my best lap yet by braking a tad too late heading into the hairpin at the end of the back straight. I was still feeling uncomfortable too, but was dealing with it reasonably well. My fourth run consisted of a switch to the Options and a spin on my out-lap exiting the hairpin due to turning in too early yet again. It was nothing severe and I pressed on to wind up behind Liuzzi who held me up on my next lap, so I aborted and passed him on the outside in turn 2 (yay for more grip on the Options!). I improved my time on the following lap, ensuring the run wasn’t all bad. My fifth run was where I noticed it was overcast again and it featured clean laps with nothing else to report. Run six saw a decision to attempt a hot lap under pressure from the time limit of the quickly expiring session. I crossed the line with only 2 seconds to go, allowing my flying lap to go ahead but yielding no improvement, unfortunately. Still, it was good to intentionally add some pressure to see how I handled it and despite no improved time, I think I handled it quite well so I’m quite pleased with that. I ended up 11th for the session with a 1:38.375, the 14 laps in total okay but perhaps not as good as I was expecting. The discomfort, mistakes inspired from it and various competitors impeding my progress combined to make for an average session, though when considered alongside the previous two I still made progress for the weekend. I didn’t quite match my time from P1, though. Virgin expect 20th or better for Qualifying, which should be doable if Malaysia -- where similar expectations were required -- is anything to go by. An interview just before the session asked how I thought my team compared to the others, to which I replied that I thought we were travelling along nicely for a new team. I only just got through to Q2 on my last flying lap which was done under pressure from the expiring time. It was the third sector which got me through -- instead of sector one which had been my best in practice -- and it was great to achieve a time under pressure. My earlier runs in Q1 were fine, all laps remaining clean and consistent but just not being fast enough so I was quite lucky. Q2, however, wasn’t so clean, my first flying lap in my first run aborted due to having to avoid two spins in turn 2; I think one was Jenson Button and the other Schumacher but I’m not entirely sure. Switching to fresh Options (the others were quite worn as I had used them in practice) my second run was consistent and clean, though the first attempt at a lap was slightly scruffy. Unfortunately for me I didn’t progress through to Q3, sitting outside of the top ten with a time of 1:38.714 and in 13th for the race. It’s a little ironic how the time I set in P1 is still my best for the weekend. I also found it quite remarkable that the top times in qualifying were basically the same as the ones in Malaysia, despite the different layout. Proves how similar the two circuits really are I suppose. Overall I’m happy with my performance in qualifying but definitely feel I could have done slightly better, and it certainly felt as if the weekend was going backwards slightly. I exceeded my team’s goal of 20th, and was much more confident in the session than I was in P3. Hamilton obtained pole. A post-qualifying interview asked about my car’s performance and my thoughts on the session; I told them that I thought the car was working well for me and that we as a team are right where we want to be. 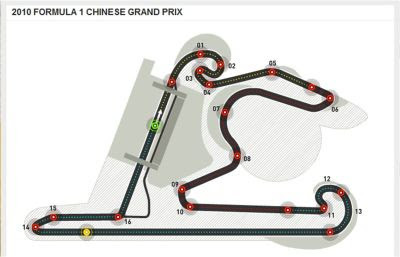 Due to my decent qualifying position and China’s similar track layout to Malaysia, Virgin expects me to finish in 18th or better which I think is possible. So much so, in fact, that I’m aiming at 15th or better but we’ll see how things go. I’m starting on the Prime tires for the race with a long first stint and then switching to the Options to end the race. There’s a 47% chance of rain according to the radar, something I hope eventuates as I need more practice in the wet and seemed to handle it nicely in Malaysia. Unfortunately for me I had yet another slow start, dropping a few positions to 16th but didn’t mind as I had nowhere to go with so many cars everywhere, piling into turn 1 and 2. I managed to pass Buemi between turns 6 and 7 which brought me to 15th but then went wide in the same section on the following lap, giving him the position back. I believe it was the heavy fuel load in the car -- and my inexperience with it -- that caused me to go wide so easily. On lap 3 Rosberg spun in turn 3, giving me 15th back in the process. On lap 4 there was debris on the track that I had to avoid -- probably from Rosberg’s earlier spin -- and on the same lap I went wide at the hairpin at the end of the back straight. This put Kobayashi on my tail, where he stayed for a handful of laps before something strange happening. One minute he was there, the next he wasn’t and I was told that Lucas Di Grassi, my teammate, was in 16th instead. I had a minor spin in turn 2 due to accelerating too early, allowing Lucas through while Chandok got past on lap 12, between the hairpin and the final corner. It was at this point I realised that my tires weren’t that great and they were causing me to struggle. These moments put me down into 17th place but that didn’t last long as I got 16th back on lap 14 due to Chandok pitting. I was lapped on lap 16 and noticed on the next lap that it was becoming overcast yet again. On lap 21 it began to lightly rain, the conditions welcomed by me but unable to be used to my advantage (I felt) due to me having to move aside for the frontrunners. This allowed Chandok to catch back up, but he pitted again on lap 26 and Senna -- who was behind him -- ended up being the one to pass me instead. I figured it was because he was on wets, because my pace was still pretty good in the increasingly wet conditions. I pitted on lap 27 as the conditions were worsening and I was aquaplaning a lot, opting for wets instead of the team’s recommendation of intermediates. Unfortunately I lost control heading into the pits on the wet surface and went straight into the wall, losing my front wing in the process. 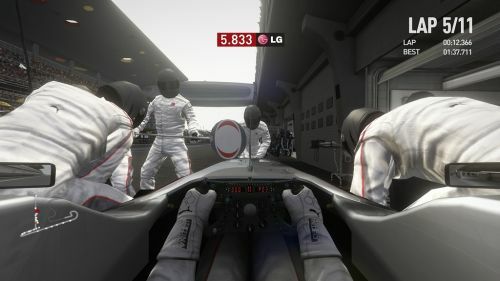 I got penalized, too, as I was trying to recover by reversing into the pit lane, resulting in a drive through. I did this immediately, coming back in for it on lap 28 to get it out of the way. Angry, I lost motivation and figured that this race was essentially done, an attitude I came to regret a little later. Now situated at the back and in last position, I continued the race with a disheartened approach, though quickly got over it when it came time to overtake Kovalainen on lap 29, something I managed into the hairpin. Up next was his teammate Trulli who I passed on the main straight as he pitted, then after that it was Kobayashi on lap 30 as we both headed into turn 1. 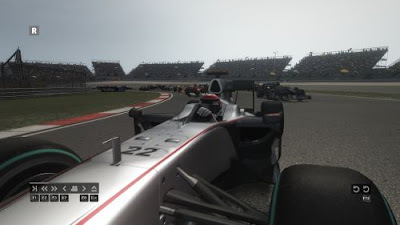 On lap 31 I passed Hulkenburg who was in the pits and at the same time, Senna was exiting and came out in front of me. I quickly got by him on the next lap, giving me 17th position. In turn 6 on lap 35, I had a minor spin, the track severely wet and my recovery allowing Senna to retake the position, though a pitstop for him gave me the place back relatively quickly. On lap 39 Virgin informed me that Lucas had retired, giving me his position of 16th in the process. On lap 50 Chandok pitted for what seemed like the fifth time, giving me 15th, while on lap 51 the track started to dry out. On lap 54, with a dry line forming, I passed two cars for 13th, both of whom were in the pits changing to dry tires. Due to being 2 laps down, I stayed in 13th and finished there, my best result yet. It seems choosing the wets paid off as I gained positions while everyone else swapped to inters and then the wets as the conditions kept worsening. Their change back to the dry tires near the end of the race also benefitted my progress, since I elected to stay on my tires until the end. I was a touch nervous about staying on the wets as the track dried but I wasn’t slowing down, and I cooled my tires whenever possible in the puddles that weren’t on the racing line. All in all China was a great race for me despite initial signs suggesting it was another average one, my best result yet definitely being something to be proud of. Overall I think my performance in general is improving and while unpredictable conditions certainly helped me -- and certainly seem to suit me -- I think I can also say that I’ve stepped up and continue to progress as the season does. Webber won the race, Hamilton came in second and Alonso managed third. My 13th placing puts me into 19th in the driver’s standings, while Virgin went up to 11th in the constructors’, moving ahead of Lotus. I met both mine and Virgin’s expectations in the race, something they congratulated me on when I got back to the garage, my agent in particular expressing her delight in my performance. Onwards to Spain and the infamous Catalunya circuit, then! Note: All images are of the PC version (save for the map) and were sourced from here; this game continues to prove difficult when it comes to finding images.